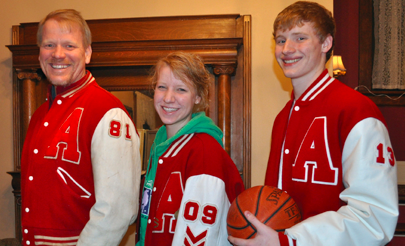 Austin center Joe Aase knows all about his dad Lee’s history on the basketball court. He knows he went to the state basketball tournament in 1981 with the Packers and he knows he played in the title game. Joe also knows about his sister Rebekah. He knows she played in the state basketball tournament in 2008 because he was there. Now Joe’s hoping he finally gets his chance to play in the state tournament as the Packers (12-4 overall, 9-2 Big Nine) are currently sitting atop the Section 1A standings and are just a half game behind Owatonna in the Big Nine. 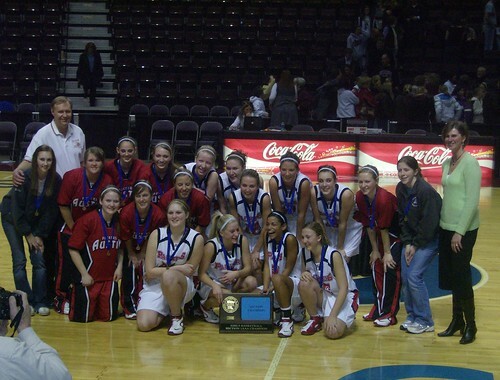 As a dad, it was a great blessing to be able to watch Rebekah and her team get to the state tournament in 2008 (I wrote about it here), and now Joe and my nephew Tom (who also is a junior starter on the boys’ team) are part of a team that is poised to make a tournament run. It’s particularly neat for my dad and mom, who also still live in Austin, to be able to watch both grandsons play, and also to get to go to Rebekah’s games as she is now playing at the local community college. As a volunteer with the team’s booster club, I’m applying the SMUG philosophy, using social media tools to track (and promote) the team’s progress through a blog (the Packer Fast Break Club site), a YouTube channel and a Twitter account. I’m using a Flip camera (on a tripod) to capture game highlights to post to YouTube. Since I already had the Flip, the total cost for all of it is about $20 a year for the PackerFastBreakClub.com domain and mapping it from WordPress.com. How are you using your SMUG lessons to provide low-cost, high impact support for community or volunteer programs? In The Five Dysfunctions of a Team, which I reviewed here, Patrick Lencioni highlights five characteristics of groups that have not become true teams. I said my next post would turn those dysfunctions upside down, and positively highlight characteristics of one of the most effective teams I’ve had the pleasure to observe. In Lencioni’s leadership fable, his protagonist Katherine relates the story of her husband, a basketball coach, who benched a talented player who was focused on personal statistics instead of team results. Yet (or maybe therefore) his teams consistently had winning seasons, because of the synergy that comes from teamwork. One way we keep the costs down for Social Media University, Global is by not having any athletic teams. Also, unlike our online university colleagues at the University of Phoenix, we haven’t paid millions for the naming rights to a football stadium. But clearly, sports can be powerful for marketing. That’s why a major retailer paid $18.75 million in 1990 for the naming rights to the facility where SMUG’s adopted team will be playing its first-round game in the Minnesota State High School girls’ basketball tournament. You see, your Chancellor has a daughter on the Austin, Minn. team. Rebekah Aase is a 6′ 1″ junior center for the Packers, who enter the state tournament with a 20-7 record. But she’s not the star of her team. There is no star for her team. This is not a team that relies on one player for a major portion of its points. Nine girls see regular action in every game, and six or seven of them have led the team in scoring in at least one game. A gimmick defense like a box and one or a triangle and two is completely worthless against the Packers. A different player steps up each time to take the scoring load, as Jenny Fisher, Rebekah Aase and Kristina Vorpahl led the team in scoring in the Packers’ three tournament games. Brittney Gibson sank the three-point buzzer beater that clinched the state tournament berth after being scoreless for the first 33:58 of the game. And part of being a team is understanding that scoring isn’t the only way to contribute; for example, senior co-captain Tana Lukes had seven steals in the section semifinal win. So here’s how the Packers have done it, and how they positively demonstrate the opposite of Lencioni’s dysfunctions. Trust – When team members know that every other member has their best interests at heart, and a single overriding goal, they have freedom to fail and therefore freedom excel. The Austin girls know that they can step up to take a big shot without worrying that their teammates will criticize them if they miss. Coach Gary Peterson says this is the closest team he’s ever had. The girls all genuinely love their teammates. Constructive Conflict – On a sports team, this probably pertains more to the coaches than to the players, but development of a winning game plan requires the coaching staff to brainstorm all the options and debate the best approach to use against a given opponent. As the plan is being implemented in practice, the players need to ask questions to be sure they are clear on how things should be done. And in the heat of the game, they can talk about what’s working and what isn’t, so the coaches benefit from their perspective. The leader, the head coach, needs to make the final decision, after weighing all of the input. Commitment – Once a game plan has been created, everyone needs to be fully committed to execution. Even if it wasn’t what they would have decided individually, the only way a team can work effectively together is to completely commit. If anyone holds back and second-guesses, the plan won’t work. Accountability – Team members and leaders need to hold each other accountable for keeping their commitments. When Rebekah is fronting the post, for instance, she needs to know she’ll have help on the back side defending the lob pass. And when the guards are aggressively pressuring the point guard, they need to know she’ll be patrolling the lane if the point penetrates. Focus on Results – The Packers’ balanced scoring speaks for itself, that no one is putting individual results ahead of team success. As a result, they’ve reached a goal together that wouldn’t have been possible without exceptional teamwork. To see more about the Packers and an application of social media (specifically Facebook) as a sports booster club, visit the Packers’ fan group and read about why Facebook groups beat blogs for this purpose.